Available for the first time: audio editions of Milly's brilliant short stories: Here Come the Boys, The Wedding Dress, Ladies Who Launch and The Barn on Half Moon Hill. 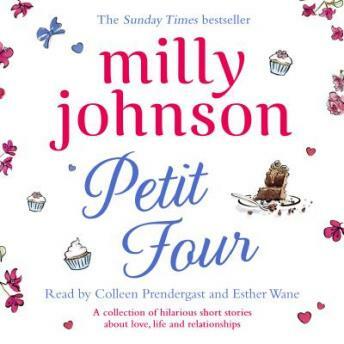 Milly Johnson is the sparkling and irrepressible author of six bestselling novels. She is also a columnist, greetings card copywriter, poet and after-dinner speaker. Her books are about the universal issues of friendship, family, betrayal, babies, rather nice food and a little bit of that magic in life that sometimes visits the unsuspecting. This audio edition is read by Colleen Prendergast and Esther Wane, who have narrated books by Cathy Bramley, Jill Mansell and Milly Johnson's The Queen of Wishful Thinking.